It’s final. 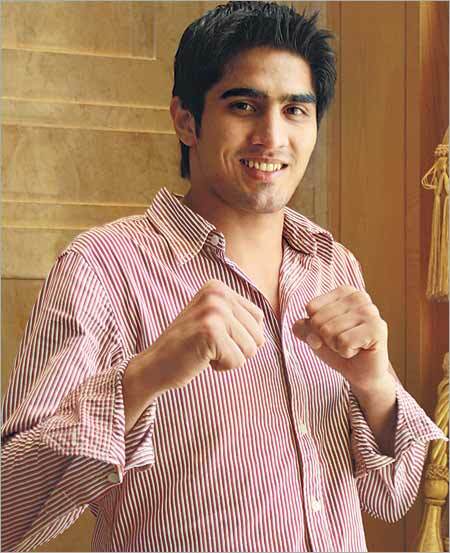 The handsome much-in-the-news celeb-boxer Vijender Singh, who brought home an Olympics medal for us, is all set to make his acting debut. After many false and misleading reports of his debut as a leading man, Vijender’s bona fide acting launch would be in a film entitled Patiala Express, where the boxer plays….a boxer! The film to be produced by Percept Ltd, will start shooting early 2011. Before that, Vijender, not much of an actor but possessing the charm and public connectivity to set the screen on fire, will undergo three months of acting course from October onwards. Vijender’s film won’t only be a launch pad for the popular boxer; the producers are looking at it as a means of promoting boxing. Patiala Express would endeavour to be the first authentic boxing film for India. The director is yet to be finalized. As for Vijender’s leading lady, buzz is Bipasha Basu is stepping into the boxer-turned-actor’s romantic arena.